It is convenient to express the elasticity of a material with the ratio stress to strain, a parameter also termed as the tensile elastic modulus or Young's modulus of the material - usually with the symbol - E.
Young's modulus can be used to predict the elongation or compression of an object. Note! You can use the pressure unit converter to switch between units of Modulus of Elasticity. Engineering ToolBox, (2004). 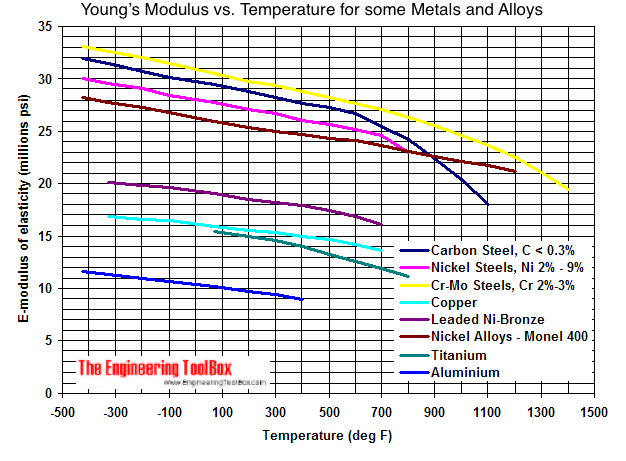 Young's Modulus of Elasticity for Metals and Alloys. [online] Available at: https://www.engineeringtoolbox.com/young-modulus-d_773.html [Accessed Day Mo. Year].